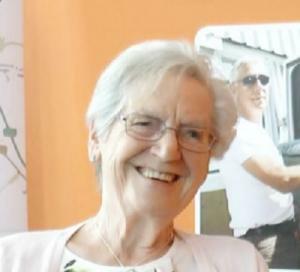 As well as seeing a counsellor, Evelyn has been attending weekly Day Hospice sessions for five months now, and is driven to and from the sessions by Phyllis Tuckwell’s volunteer drivers. There she has complementary therapies, attends our Social and Therapeutic Horticulture sessions, and enjoys meeting and having lunch with other patients who are in a similar situation to her. “I’ve met some wonderful people, not only patients but the staff, they’re absolutely fantastic. I cannot fault any of them, they are wonderful,” she says. Evelyn is having fortnightly chemotherapy treatment, but finds that with our help she is able to cope with these sessions. “I’m ok, I’m handling it. I’m managing. I’m getting through it because of the simple reason that I’ve got lovely people around me, lovely people that help and I am very, very lucky – wonderful friends, wonderful family. I’m enjoying my life, what time I have left. I’ve got a little dog and I go out walking twice a day, and I go out with my son and daughter, and meet friends. They’ve given me so much here that I cannot thank them enough. If ever I want to have a chat, if ever I’m feeling down, they’re always here for me.